﻿ Hartman Rock Garden - Ohio. Find It Here. The Hartman Rock Garden is one of the nation's most intriguing and revered works of folk art, an outsider art phenomena where self-taught artists construct fascinating worlds out of concrete, metal, stone, and whatever else they can find.In 1932, at the age of 48, and in the midst of the Great Depression, Ben Hartman was laid off from his job as a molder. He was not content with his newly-sedentary lifestyle and began constructing a cement fishing pond in his backyard. By the time he had finished the project, Ben was hooked. He began constructing a variety of structures and figures, following the themes of history, religion, and patriotism. For the remaining twelve years of his life, Ben filled his yard with over fifty structures, numerous varieties of plants, and countless handmade figurines. Using hundreds of thousands of stones, Ben had created a very unusual garden. In 2008, the Wisconsin-based Kohler Foundation, known for its involvement in the preservation of significant folk art sites across the country, purchased and restored Ben and Mary's unusual masterpiece. In December 2009, with most of the restoration complete, Kohler transferred ownership of the site to the newly-formed Friends of the Hartman Rock Garden. 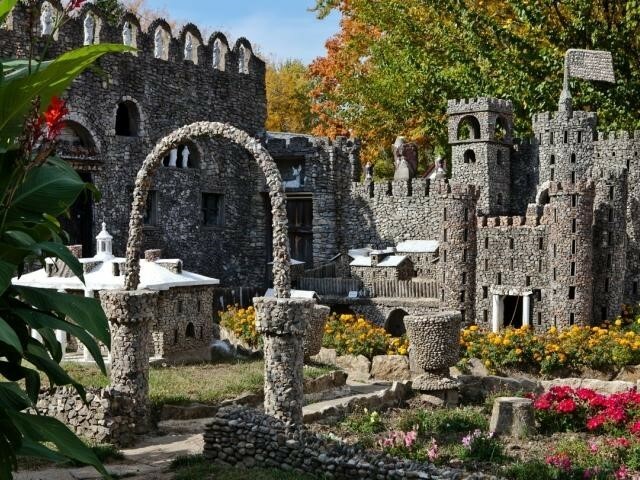 Over the past eighty-plus years, the Hartman Rock Garden has welcomed tens of thousands of visitors from all over the world. With its recent restoration and ongoing preservation, it is poised to welcome countless more over the coming decades.